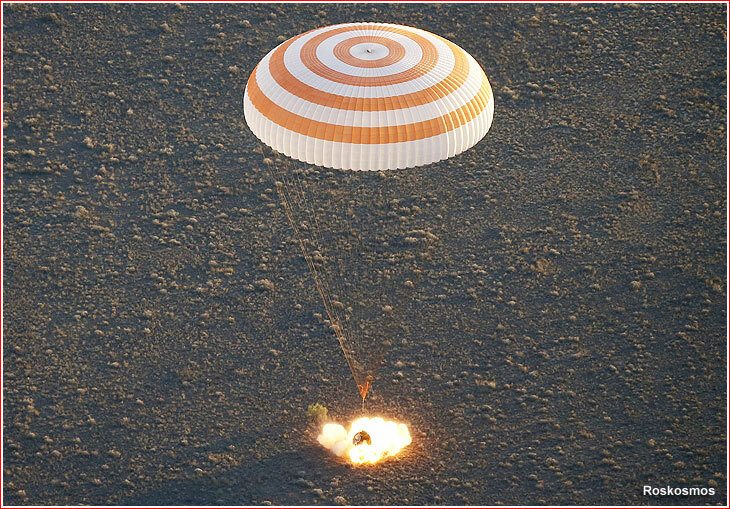 Perhaps the riskiest and scariest part of the Soyuz flight comes at the very end, with the fiery reentry into the atmosphere, followed by a rough touchdown, which, according to many crew members who have experienced it, can only nominally be called soft. 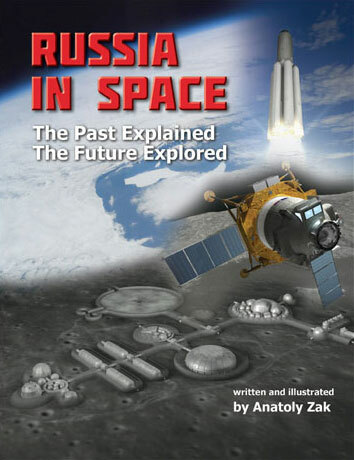 The early history of the spacecraft was punctuated by two fatal accidents during the landing of the Soyuz-1 and Soyuz-11 missions, which took lives of four cosmonauts. 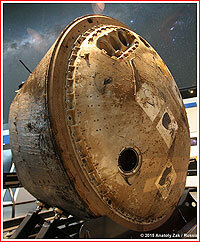 However, after 1971, the Soyuz has safely brought home all its passengers, despite a few nerve-racking incidents. 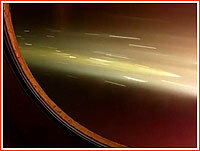 A rare image shows the reentry of the Soyuz TMA-13M mission from the vantage point of the crew inside. A European astronaut Alexander Gerst is enjoying the view. 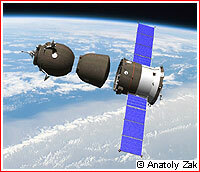 For all Soyuz missions to space stations, the return to Earth begins with undocking. Prior to their departure from the Earth-orbiting outpost, crew members conduct tests of the motion control system in the Soyuz. The crew then boards the vehicle and closes the hatches connecting the transport vehicle and the station, followed by leak checks in the docking port. The hatch between the Descent Module and the Habitation Module is also closed and all crew members, dressed in Sokol launch and entry suits, take seats inside the Descent Module. On the International Space Station, ISS, the undocking typically takes place during the final (14th or 15th) orbit of a particular day, around 3.5 hours before a scheduled touchdown on Earth. After opening the hooks of the docking mechanism, spring pushers in the docking port give the spacecraft around 0.12 meters per second in relative motion away from the station. The crew monitors the station via an external camera on the Soyuz and makes sure the ship remains in stable flight as it backs away from the outpost. Around three minutes after undocking, with the two spacecraft around 20 and 30 meters apart, the Soyuz usually performs an eight-second firing of its DPO-B attitude control thrusters delivering between 0.4 and 0.5 meters per second in velocity change to reach a safe distance from the ISS. A similar 15-second maneuver is conducted around a minute later to ensure that the spacecraft will not rendezvous with the station again after one orbit. After two and a half hours in solo flight, when the Soyuz is around half an orbit from its landing site, the spacecraft orients itself tail first in preparation for a braking maneuver, normally conducted over the Southern Pacific and the Atlantic, near the southern tip of South America. Unlike a usual orbit correction, mission control sends a "descent" radio command to the spacecraft prior to the maneuver. In addition, a backup battery is plugged into the main buffer battery, to give the craft maximum "juice" during the remainder of the flight. Once the ship is flying tail first, the engine cover opens and the main engine fires against the direction of the flight for less than five minutes. The braking maneuver can be conducted in a fully automated mode or it can be initiated manually by the crew, in case of an emergency. If something goes wrong, for example, the spacecraft loses its correct attitude, the crew can abort the maneuver and repeat it during a backup landing opportunity, which is always available. Moreover, attitude control thrusters, DPO-Bs, can finish the job if the main engine quits too early. If necessary, the crew can activate those engines and keep them firing for the necessary duration based on real-time calculations onboard. If the spacecraft is unable to reach the planned landing site, the crew can still return to Earth with the use of the so-called Mode 14, which is constantly updated when the spacecraft is within the range of ground stations. Based on the "descent" command, the flight control system aboard the Soyuz activates the sequence for the separation of the spacecraft's modules as soon as it detects that the braking maneuver has been completed. In preparation for the split of the modules, external cable lines connecting the three main sections of the spacecraft and the six petals of the thermal protection layers on the Descent Module, SA, are shed. The Habitation Module is then depressurized, while the crew members in the Descent Module close the visors on their helmets. When the spacecraft is in the correct attitude, the Habitation Module, BO, and Instrument Module, PAO, separate from the Descent Module. During a nominal landing, the separation of three modules takes place at an altitude of 140 kilometers over the Arabian Peninsula. 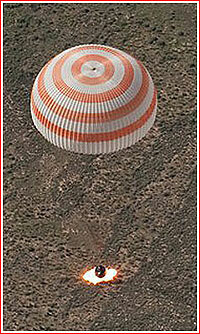 The Descent Module with the crew heads for landing, while the two other compartments burn up in the atmosphere. To ensure that the modules do separate before entering the atmosphere, there is a quadruple backup system. During a nominal flight, the onboard computers of the flight control system, SUDN, issue the separation command automatically. If this doesn't work, a backup programming timer should activate the so-called Sequence No. 11 to activate separation, also automatically. If both of these automated systems fail to work, the crew can initiate the process from its console in the capsule. As a very last resort, signals from thermal sensors on the tail of the vehicle will detect the rising heat from the increasing friction of the Earth's atmosphere as the spacecraft descends and trigger the separation sequence, though it would take place later than usual. Right after the separation, a dual VHF PRD radio operating at 121.5 megahertz is activated aboard the Descent Module. 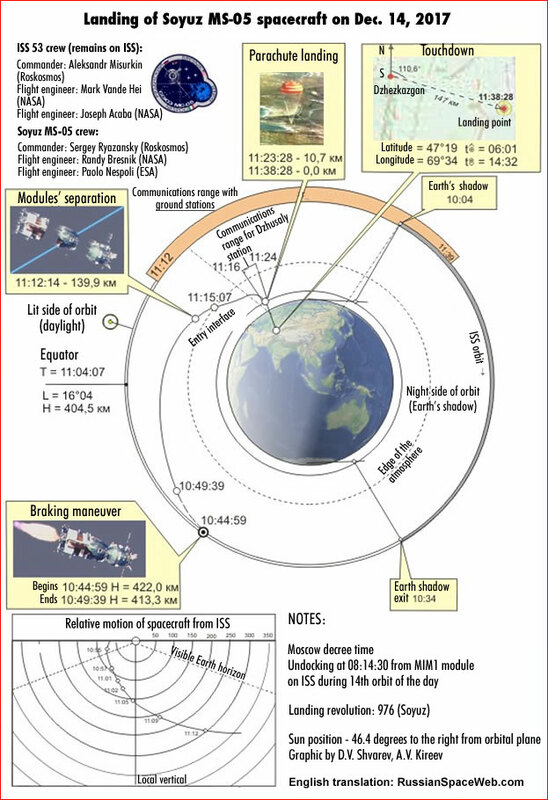 Under normal flight conditions, the Descent Module enters the Earth's atmosphere under an angle of 1.35 degrees toward the local horizon, at an altitude of around 100 kilometers above the Earth's surface. By maintaining its correct pitch angle, the capsule can generate some aerodynamic lift, which makes the return trajectory less steep and subjects the crew members to less g-loads than those they would experience in a ballistic descent. Still, all Soyuz crew members must be prepared for the ballistic return mode (known as BS in Russian), in case of emergency, such as a failure of the flight control or the attitude control system. 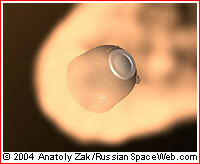 In any case, the capsule decelerates sharply as it encounters the dense atmosphere. Around three minutes after the separation of the Descent Module, the air friction causes ablative layers of the capsule to burn, while forming a bubble of plasma around the spacecraft, which makes communications with ground control stations largely impossible for around five minutes 40 seconds, which is long enough for the capsule to descend from an altitude of 90 kilometers to just 35 kilometers. The flight control system provides the roll of the capsule in order to adjust the landing trajectory. The particular roll angles are calculated by the KSO20M instrument or can be induced by the crew based on indications from the manual control console, RUS. The roll control process is concluded around one minute before the activation of the parachute system. In case the automated control of the landing trajectory is impossible, but other means for maneuvering the capsule are still functioning, the crew can still try the aerodynamic descent mode or switch to a ballistic mode. 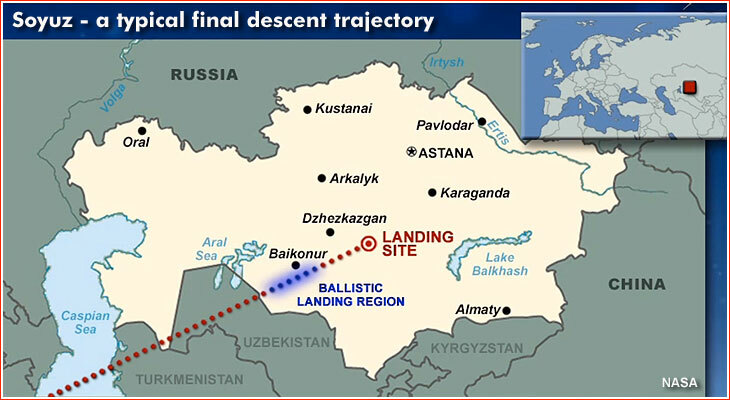 A typical final descent trajectory for the Soyuz spacecraft in Kazakhstan. Around three minutes after exiting the plasma and around 15 minutes before landing, the capsule slows down to a speed of 900 kilometers per hour at an altitude of 13.5-12 kilometers. At that point, the cover of the parachute container is jettisoned and the parachute system begins to deploy at an altitude of around 10.5 - 9.5 kilometers. 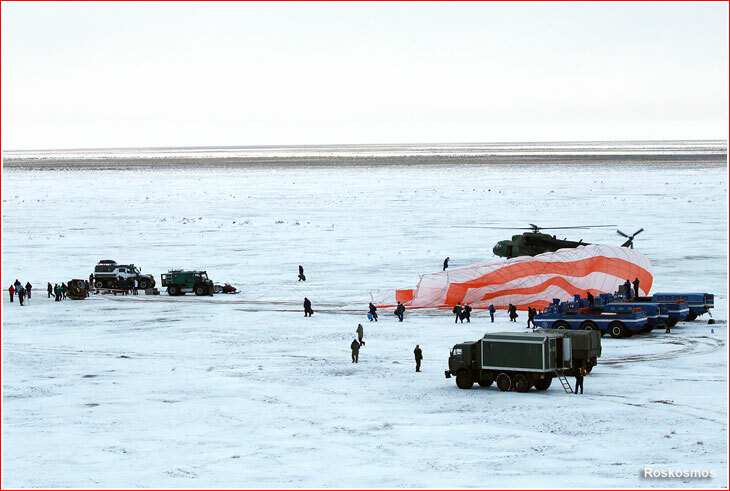 First, two pilot parachutes with areas of 0.62 square meters and 4.5 square meters deploy, pulling out the drogue chute with an area of 24 square meters. The drogue parachute slows down the capsule from a speed of 230 meters per second to 80 meters per second (360 kilometers per hour). 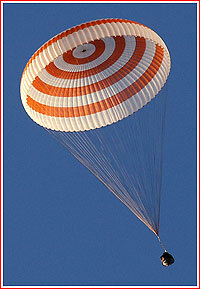 At this point, the main parachute with an area of 1,000 square meters opens and the braking parachute is jettisoned at an altitude of 8 - 7.5 kilometers. 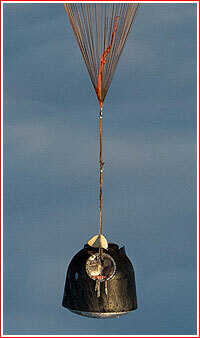 When the main parachute is fully deployed, the reentry capsule enters a stable descent with a speed of around six or seven meters per second (25 kilometers per hour). Just in case, a backup parachute, half the size of the main one, is available to deploy from a separate compartment as needed. If everything goes as planned, the flight control system initiates a series of pre-landing operations at an altitude from 5.8 to 5.6 kilometers. First of all, the bottom heat shield of the capsule is jettisoned, revealing six solid-propellant motors, a blinking light beacon and the Kaktus-2V ("cactus") gamma-ray altimeter. The two latter devices are immediately activated. On the sides of the capsule, external window covers are dropped. The so-called Board of Automated Pressure Control, BARD, opens at an altitude of 5.5 kilometers to begin equalizing the pressure inside the Descent Module with the atmospheric pressure. Also, the valves of the SIOS landing control thrusters open to drop pressurization gas and drain remaining hydrogen peroxide propellant, whose long trails of smoke are sometimes captured by tracking cameras on the search and rescue aircraft. The Rassvet-M transmitter begins sending signals via an antenna in the parachute lines. Also, the shock absorbing system in the cosmonaut chairs is armed. Finally, the air vessel of the main parachute is pressurized and the air is released from the backup parachute pressurization system, while the rescue system tanks, KSS, (which pump air into cosmonauts' suits) are depressurized. Initially, the capsule descends with its main axis under an angle of 30 degrees from the vertical axis to facilitate the cooling of its surface. 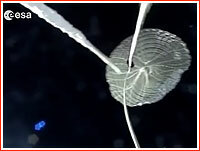 At an altitude of 5.2 kilometers, and three seconds after the SIOS system drainage, the parachute's harness disconnects from its attachment to the parachute container and instead pulls out suspension cables connected to the sides of the capsule. This switch ensures the vertical position of the spacecraft at touchdown. Soft-landing motors fire at touchdown. At an altitude of eight meters, the "Posadka" (landing) signal lights up on the cosmonauts' console and at an altitude between 1.1 and 0.8 meters from Earth, the Kaktus altimeter issues a command for the firing of the braking solid motors, DMP. The spectacular firing takes place around 0.7 meters above the surface, reducing the descent speed of the capsule to between 0 and 3 meters per second. A speed of 2 or 1.5 meters per second is considered average at the touchdown point. 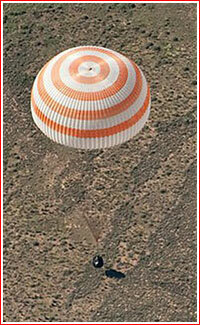 The structural loads on the capsule at the moment of DMP firing was quoted as 0.1 kilograms. 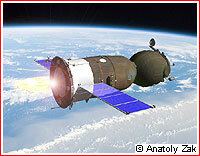 These loads were reported to be the main reason for ruling out the reuse of the Descent Module. In case of landing under a spare parachute, the descent speed could reach as high as 9.5 or even 10.5 meters per second, but it is still considered to be survivable by the crew. 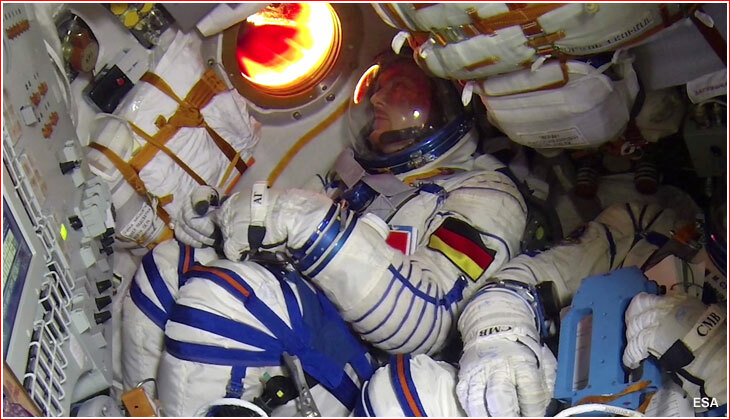 Some additional cushioning at touchdown is provided by individual crew seats, known as Kazbek (Kazbek-UM on Soyuz TMA) equipped with custom-fitted liners for each crew member. 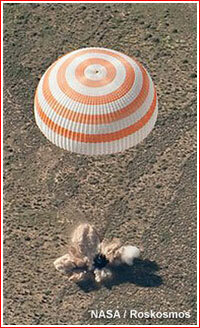 As a last resort, the bottom of the capsule also designed to absorb the shock of a particularly bad impact. After touchdown, the cords holding the parachute are cut to prevent the capsule from being dragged by the wind, however, the craft still occasionally ends up on its side with its exhausted passengers hanging on their seat belts. In the meantime, the valves of the breathing system open into the spacecraft. Some eight minutes after the firing of soft-landing engines, an automated command is issued to jettison the cap covering one of three housings of the ABM-279 antenna. If the capsule is on its side, one of three antennas located in the highest position also deploy. Alternatively, the same command to deploy antennas can be issued by the crew earlier. In case of a water landing, the crew has five minutes to overrule the release of the antennas at the bottom of the capsule. Both VHF transmitters operating at 121.5 megahertz and short-wave radios, working at 8.364 and 18.060 megahertz, send their signals through the antenna helping rescue services to home in on the capsule. If the crew exits the capsule before the arrival of rescue personnel, the cosmonauts can deploy their own ABM-281 short-wave antenna, operating at 8.364 and 18.060 megahertz. Beginning in 2016, the signals from the autonomous navigation system, ASN, sent to mission control via two Luch data relay satellites, could also be used to pinpoint the landing site by the search and rescue team. Because, the two out of six soft-landing motors aboard the Descent Module consist of two sections and only one of those sections fire during the nominal landing, the recovery personnel have to extract remaining live charges from the motors. 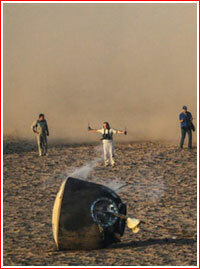 Specialists then burn the solid propellant in the steppe, at a safe distance from the capsule and other members of the search personnel. 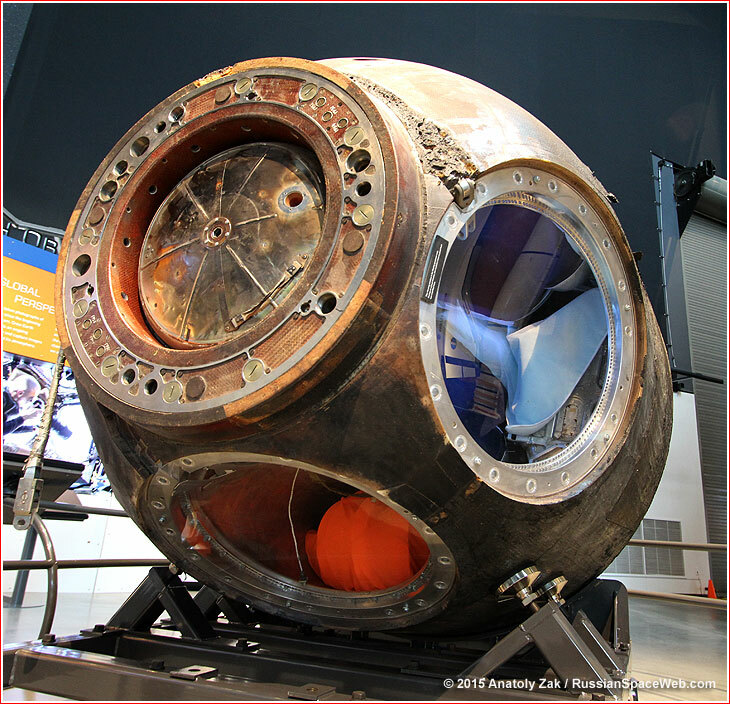 A museum of copy of the descent module after landing. Soyuz can land with an accuracy of only 28 kilometers, (with a probability of 0.9997), in the automated aerodynamic descent mode, AUS, relative to the center of the projected landing area. The main reason for such a low precision is the suseptibility of the parachute landing to winds. Moreover, in case of a ballistic return, the capsule can end up as far as 600 kilometers short of the primary landing site for the aerodynamic mode. As a result, all Soyuz landings have to be planned over a flat and open areas without any structures, rivers or even trees. A total of 13 areas currently meet all the requirements for the Soyuz landing. Ironically, all of these sites are in Kazakhstan and none of them are in Russia. When planning Soyuz landings, engineers usually try to put the spacecraft down into the most preferable area during the first or second orbit of the day, as the spacecraft moves on the ascending arc of the orbit from south to north. If this is impossible, they go down the list of 13 sites, according to their priority order. 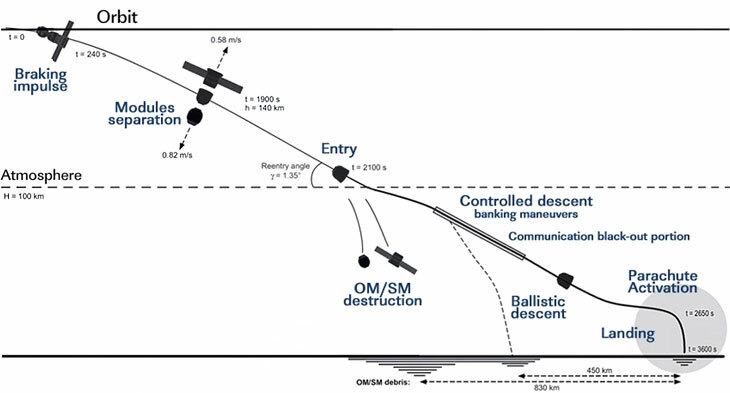 If nothing works, mission managers can request an orbit correction or extend the mission to ensure that the ground track of the final orbit goes over the desirable landing site. 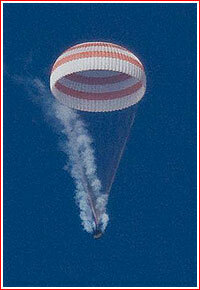 Opening of the Soyuz' parachute system as seen from the Descent Module. 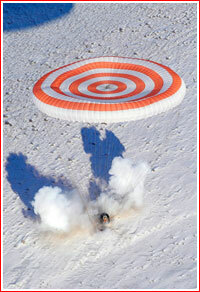 Descent Module under a parachute. Click to enlarge. 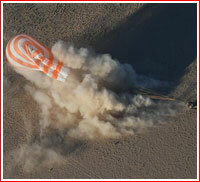 Descent Module of the Soyuz spacecraft touches down in Kazakhstan. Sometimes Descent Module ends up on its side after touchdown. Click to enlarge.